Scott Walker John Doe investigation: Walker tied to secret emails. Gov. 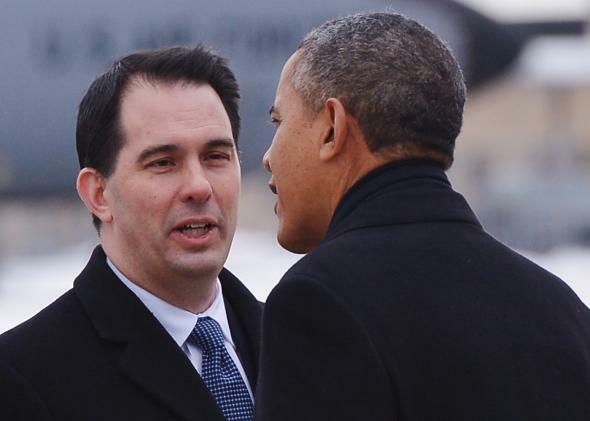 Scott Walker with President Obama on Jan. 30. More than 27,000 emails were unsealed Wednesday after a years-long investigation into Scott Walker’s campaign for Wisconsin governor. And, for the first time, Walker has been directly tied to a secret email system that members of his staff used to coordinate his gubernatorial campaign while Walker was Milwaukee County executive. Among the pile of emails, it was found that Walker also used his campaign email to conduct county executive business. In June 2010, Walker emailed the conservative radio host Charlie Sykes and encouraged him to get information on Democratic groups from his office. “Ask [my official office] and we would be happy to send over the info,” Walker wrote. Before Scott Walker was elected governor in 2010, while he was still serving as Milwaukee County executive, his staff set up a secret wireless router in the county office over which they would communicate about the campaign. Walker’s aides regularly exchanged emails about the campaign during business hours, but for the first time, one of those emails directly implicates Walker in breaking campaign law. “Consider youself now in the ‘inner circle,’” Walker’s administration director, Cynthia Archer, wrote to Walker aide Kelly Rindfleisch just after the two exchanged a test message. “I use this private account quite a bit to communicate with SKW and Nardelli. You should be sure you check it throughout the day,” she wrote, referring to Walker by his initials and to Walker’s chief of staff, Tom Nardelli. Rindfleisch, Walker’s former deputy chief of staff, had more than 5,700 emails with Walker campaign staff. In 2012, Rindfleisch was convicted on one felony count of misconduct, and sentenced to six months in prison and three years probation. Walker has absolved himself of any misconduct, arguing that receiving campaign-related emails doesn’t violate campaign law as long as it doesn’t use taxpayer resources. This isn’t the end of the line for Walker’s legal woes, either—there’s a separate John Doe investigation into the funding of Walker’s 2012 recall election. The investigation is attempting to prove that there was illegal coordination between Friends of Scott Walker (Walker’s re-election campaign) and various conservative groups. One such group, the Wisconsin Club For Growth, has tried to block the investigation, taking its grievances to the state Supreme Court. Wisconsin Democrats have been waiting for years for this shoe to drop. The Democratic Party of Wisconsin has been working to link Walker to Gov. Chris Christie since the Bridgegate scandal—Christie heads the Republican Governors Association, which has poured money into Wisconsin for attack ads against Walker’s gubernatorial opponent, Mary Burke. Still, Walker’s story has gotten far less national media attention than Christie’s, probably because campaign malfeasance doesn’t make for quite as dramatic a scandal as a huge, unnecessary traffic jam. But the two cases bear striking similarities: two Republican governors with national profiles and national ambitions, allegedly using their public office to boost their political standing, all the while distancing themselves from the work their staffs sullied themselves with. Nonetheless, this could haunt Walker into his 2014 election and beyond. Burke, who’s been running a pacifist’s campaign so far, now has ample ammunition.